Test Automation using Selenium WebDriver, is the latest book released on Selenium 2.0 using Java as a programming language. This Selenium book has been designed with the objectives of simplicity and ease of understanding. After huge success of author Navneesh Garg's first book (Test Automation using Unified Functional Testing) this book follows a similar step by step approach to Install, configure and design automation framework using Selenium WebDriver and it components. This book is recommended both for those who are beginning to learn test automation (using Selenium WebDriver) and for advanced automation users. It follows a unique training based approach instead of a regular text book approach. Using a step by step approach, it guides the students through the exercises using pictorial snapshots. It includes many practical examples and issues which most of the automation testers encounter in day-to-day automation. These experiences will give you an insight into what challenges you could face with automation in the real world. Practical examples cover how to use most of the features within Selenium WebDriver. A major fear amongst functional testers who want to learn Selenium is of programming language and coding. As a part of this we will cover just enough basics on Java programming language that will give the readers confidence to use Selenium WebDriver. This book cover Selenium Webdriver integration with independent components to be installed like Java, FireBug, Firepath, Eclipse, TestNG, ANT and Jenkins (Continuous Integration tool) We will cover step by step installation, configuration and use of each of these components. Those want to know about Cross Browser testing, it covers how to use Selenium WebDriver to run o IE, Firefox and Chrome browsers. It also covers Selenium components like Selenium IDE and Selenium Grid. We will cover setup of Selenium Grid and perform parallel execution of Selenium WebDriver scripts on multiple browsers. It also covers aspects of Continuous Integration tool Jenkins so that Selenium WebDriver scripts can be integrated with the development environment and run on nightly builds. "Terrific follow-up to previous book on automation tool HP UFT... this time on Selenium Step-by-step setup of the tool and scripting tasks are both explained using easy to understand language. Automation concepts, processes, and real-life scenarios are also provided to enhance the tester's technical skills." 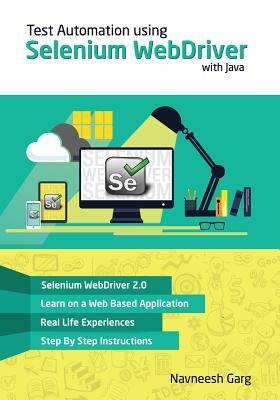 "A great hands-on guide to learn Selenium WebDriver with Java. Real-life examples and experiences are great help to understand objectives and issues with automation. A great recommend for everyone"